Fr. Bob Garon grew up in the San Fernando Valley. After years in the entertainment industry doing comedy, announcing & experimenting with New Age, he had a conversion experience that changed him forever. 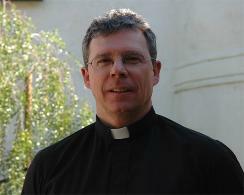 He was ordained for the Archdiocese of Los Angeles in 2005 and attended St. John’s Seminary. He was the associate pastor of St. Charles Borromeo Church in North Hollywood and is currently at Our Lady of the Assumption in Ventura. Fr. Bob is a member of the Confraternity of Priests of the Sacred Heart of Jesus, Mary and Joseph, based on the spirituality of Fr. Luke Zimmer, SS.CC. Fr. Bob has been involved in the Charismatic renewal for many years and is active in the healing and teaching ministry, particularly touching on topics such as: deliverance and healing of the family tree and healing of memories. I am writing this note to let the Apostle of Divine Mercy congregation know what really took place in my heart, in my body and in my soul that day (19th of May 2010) at the St. Mel Church. As everybody were praying, I was starting to feel something is going on in my body. I felt tears flowing and I had my eyes closed. It was almost as if I was floating. The presence of the Blessed Sacrament was so Magnificent…my human being cannot seem to handle it. There was a certain kind of electricity that was going through my veins. As soon as Fr. Bob Garon made the sign of the cross on my forehead, I just fell like a snowflake or cotton as one might describe the feeling. As I lay there, I wanted to just hold on to that Magnificent feeling of Peace, Love, Contentment, and an abundance of Happiness. The Holy Spirit was within me and I was overwhelmed and speechless. I thanked the Lord for allowing me to experience this in my life in the midst of my sinfulness and my unworthiness. I sat there in awe and wished it will never end. When I got home, I noticed there were no bumps on my skin and I did not itch. I cried at that moment because I knew then the Heavenly Father has not forsaken me. My intention of coming to this Healing was because of a severe allergies I had back in October of 2009. I went to three different known Hospitals. I was able to take 30 tablet of Prednisone. However, I didn’t get any better. I then went to another reputable Hospital and was given other allergy pills. I would lay in bed and cry myself to sleep. I went to see a doctor. I had to shower twice a day to hydrate your skin. Apply Aquaphor (Eucerin) while your skin is still a little wet to hold the moisture. Bandage your arms and even your body so the moisture will stay. I went to the Healing mass and finally got healed. I have so much to thank the Lord for. I would like to thank the people behind this Ministry and most of all Fr. Bob Garon who was God’s instrument in the Healing. Thank you from the bottom of my heart. My special thanks also to Claudia for her diligence and her faithfulness. Alleluia. God bless you all.